So your administrator is coming to visit. In an ideal world, this is your chance to ENJOY showing the amazing things you are doing and get some positive feedback and fresh new ideas. Unfortunately, these observations can easily become major stressors instead. When you feel judged by your administrator instead of supported, then the observation period becomes almost as dread-worthy as a stack of one hundred essays that have to be graded by tomorrow. It helps to have a solid battle plan. An activity that you know is going to be extra exciting for your students so they can shine and you can relax. Because your teacher observation should be something you can look forward to. After all, you are doing amazing creative work in this world, and you deserve a chance to be applauded for that. In this post, I'm rounding up a bunch of ideas for you to tap into next time you have an observation. Of course, you can also use them any time you want, whether or not anyone's coming to visit. Have students write questions on your whiteboard, or on cardstock that you tape up around your room. Hand out post-its to everyone and ask them to visit each paper and add comments and further questions using their post-its. If their comment stems from someone else's, they should attach their post-it just below or next to the one they are working from. As students visit each question, encourage them to read all the responses before adding their own. Once you feel the post-it discussion is petering out, extend it by either using some of the same questions in a spoken discussion (for which the students will now be very prepared and probably ready to reach new heights of insight) or by doing some related writing. If you've read most or all of a novel, you could do a collaborative one-pager activity. Invite students to sit together in small groups and discuss the different components as they work, but encourage everyone to make their own unique version of the one-pager. 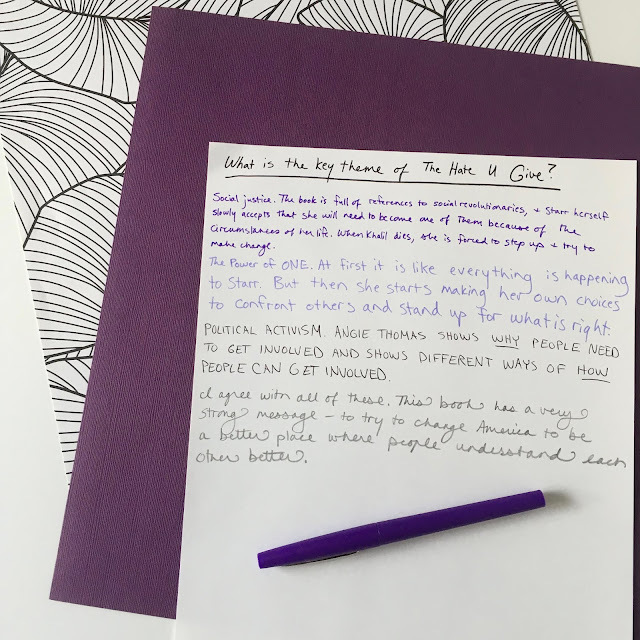 In case you've never heard of a one-pager, it's a creative strategy that asks students to share their biggest takeaways from something (a novel, film, podcast, poetry series, etc.) on a single piece of paper. It helps a lot to give them a guiding template, so they don't get overwhelmed by the blank page. You can sign up below for my popular free set of four one-pager templates with complete instructions. If you'd like to do a discussion, but your students are not apt to dive right in and shine without a lot of coaxing, consider starting with a silent discussion as a warm-up. You can read about this effective strategy for quiet classes right here. This one would require a bit of prep before the observation, but BOY would it be exciting during the observation! 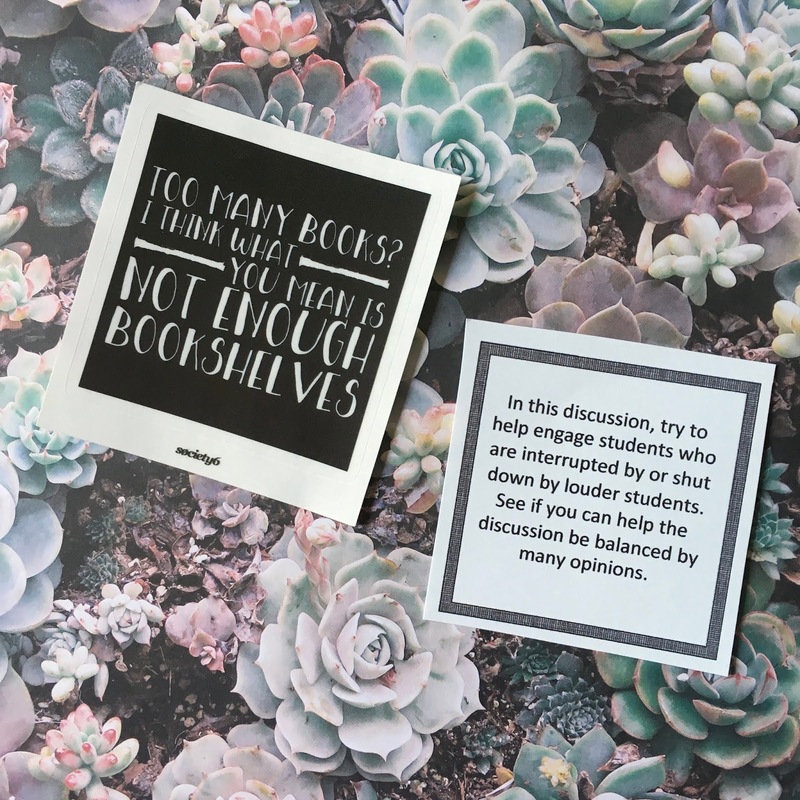 For this activity, you choose several students to act as an expert panel on a certain topic related to your novel, then set up the rest of the class in a backchannel chat to "tweet" their opinions about the discussion as it's happening. I learned about this activity from my friend Jenna Copper of Doc Cop Teaching last year on the podcast. Listen in or read the show notes here if you'd like to try it out. Escape rooms are all the rage. Whether you create one, use one from a site like Breakout EDU, or ask students to create them, escape rooms make for an incredibly engaging learning experience. Students must solve themed clues and work through relevant activities as they work their way around your room and eventually break into the final box with the final prize. If you've never heard of escape rooms, check out this post and podcast, Escape Rooms: The Ultimate Guide for English Class. Turning key moments in the text into small theatrical scenes can be really helpful in drawing students' attention to them and unpacking them together. Consider letting your students break into groups to perform mini-scenes from your recent reading, and be ready with some questions to help them dig into what mattered most in what they just watched. Bonus points for bringing in some simple props and costumes for them to use! You're going to love how much big kids enjoy dressing up now and then. If you want to dive deep into how to use this option effectively, check out podcast episode number four, "Theater in the ELA Classroom." If you're at a point where you'd like to do a discussion, but you want to be able to guide it carefully, you could pass out discussion role cards to help keep things on track. These cards give each student a secret mission, asking them to either ask a certain question, or perform a certain role relating to the group dynamics of the class. Learn more about discussion roles here. Try mixing thing up with a STEM crossover project. Ask students to brainstorm apps they think a literary character turned app designer would create. As they work on the nuts and bolts of their apps, keep them focused on connecting each part of the app to the character in the novel. What problem would their character need to solve with an app? Or what issue would their character care enough to try to impact? You can find full curriculum for this project in my TPT store if you're in the mood for a pleasant short cut. Photo by Gina Hess, Project by her Amazing Students! 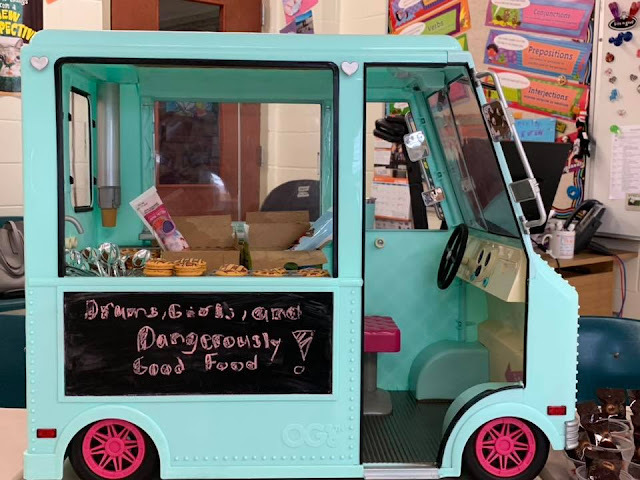 Again, if you've come a good ways through a novel, it might be time to launch a fun collaborative project like the Literary Food Truck. Let students get into small groups and get them started on brainstorming how to capture the most important elements of your current novel in the design, menu, and social media of a food truck. 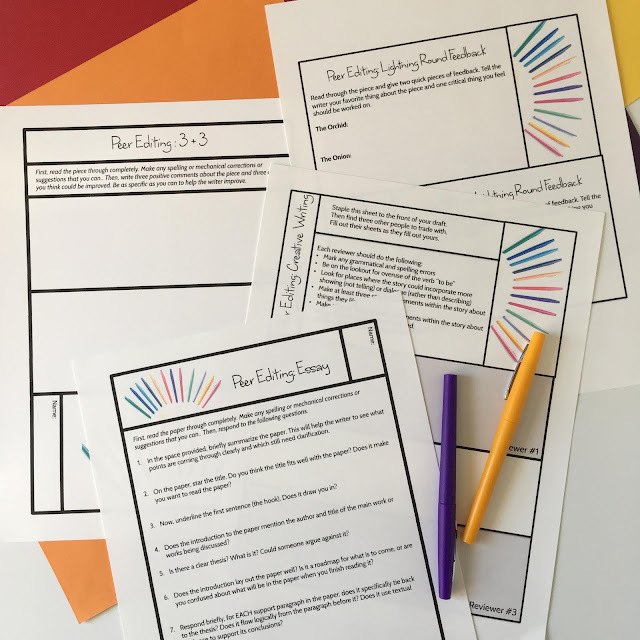 Use my free curriculum set to help you on your way (sign up below). Mock trials are one of my FAVORITE ways to bring students head over heels into a novel. In high school, my AP Lit teacher had us recreate the trial of Gustave Flaubert for obscenity after his publication of Madame Bovary. I've had my students do trials related to Macbeth and The Crucible, and loved hearing about The Daring English Teacher's mock-trail for The Stranger in podcast episode number fifty-one. If you can find a way to put one of your characters on trial, then divide up your students into lawyers, witnesses, and jury and get ready for quite a day! I first learned about the wonders of Google Classroom from Matt Miller when I interviewed him in podcast episode number forty-nine. He suggested creating a Google slide set with as many slides as there are students in your room, then letting each student design a slide. There a million ways to make this work for you. You can have students each design a slide diving into what they think is the most important theme or quotation and exploring it with text, commentary, and images on their slide. Or you can assign them different questions, characters, devices, or themes to explore on their slides. As they work, everyone will be able to see the development of their slides as the class creates a collaborative slideshow to be shared whenever you decide - after 10 minutes, 20 minutes, etc. depending on how much work you've asked them to do. Sketchnotes are a powerful way to help students process what they are hearing. Perhaps you'd like to introduce this form during an observation period, teaching students what sketchnotes are, then briefly sharing some information with them as you sketchnote your own lecture on the board, then playing a Ted Talk or short podcast and letting them try out their own sketchnotes. 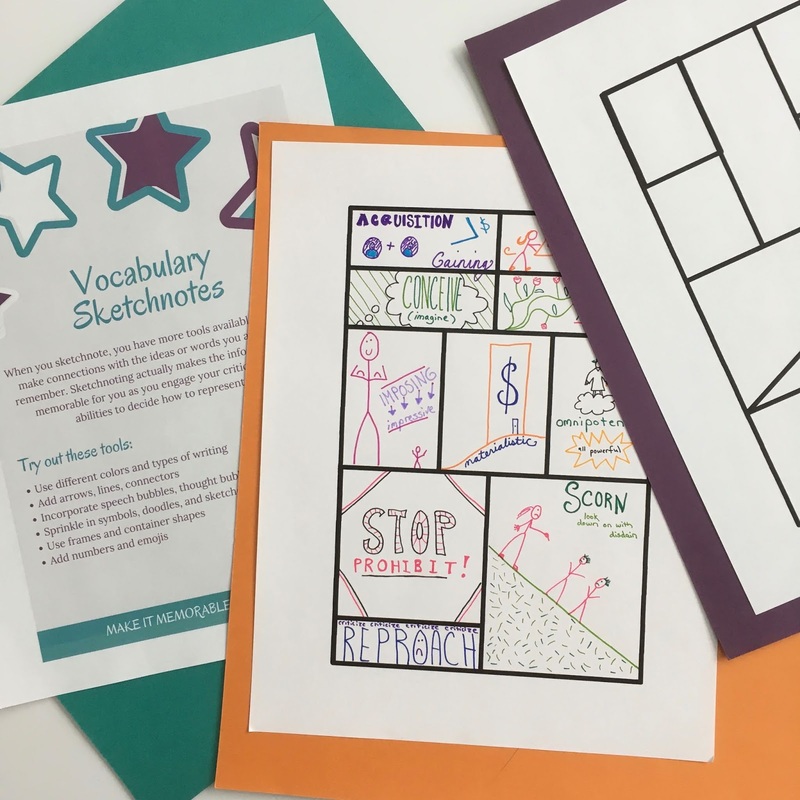 Dive deep into how to use sketchnotes and find a great video to introduce this concept in my post, The Ultimate Guide to Sketchnotes in the ELA Classroom. Snag the free sketchnotes templates featured above by signing up below. Storyboarding is a fresh way to have your students examine and interpret the details of what they've read. A storyboard is the basic sequence of a T.V. or film. It shows what will happen, but the key thing to focus on with students is that it also shows composition, lighting, angle, and other aspects of the film that put focus on different parts of the story. As they create the storyboards, they need to do so with intention. You can find my storyboard curriculum on TPT right here or create your own activity. If you'd like to get students working on a variety of activities, a differentiated menu of options provides a great structure. Consider creating a menu with categories of activities across the top, then ask students to choose one to complete from each column. For example, the first column might be short argumentative writing activities related to the reading. The second column might involve more real-world writing. The third column might ask students to find a partner and respond to different types of discussion prompts. Finally the fourth column might have some fun twists, like building a soundtrack for a scene in the reading or choosing what apps would be on a character's phone and explaining why. If your students are just beginning the writing process, consider building in some maker space elements to the brainstorming process. Give them foam boards, tape and index cards and let them move around their ideas to form the structure of their argumentative writing. Or ask them to create characters out of play doh before writing short stories. You can learn all about incorporating maker elements into your writing work in this podcast with Angela Stockman, founder of the #makewriting movement. Stations are a great way to help students work on targeted areas of their writing while keeping them up, moving and engaged. Choose the aspects of their writing that need the most work, and set up clear instructions at several points around the room for accomplishing that work. For example, one station might have a citation guide and instructions to use the guide to check through their drafts for citation format. Then you might have a certain stamp or sticker they can put at the bottom of their draft when they've completed the station. Peer editing is another great way to help students improve their writing, but it can be hard to know exactly what guidelines to give peer editors. If you'd like to do some peer editing, but aren't sure where to start, sign up below for the guiding handouts you see above. 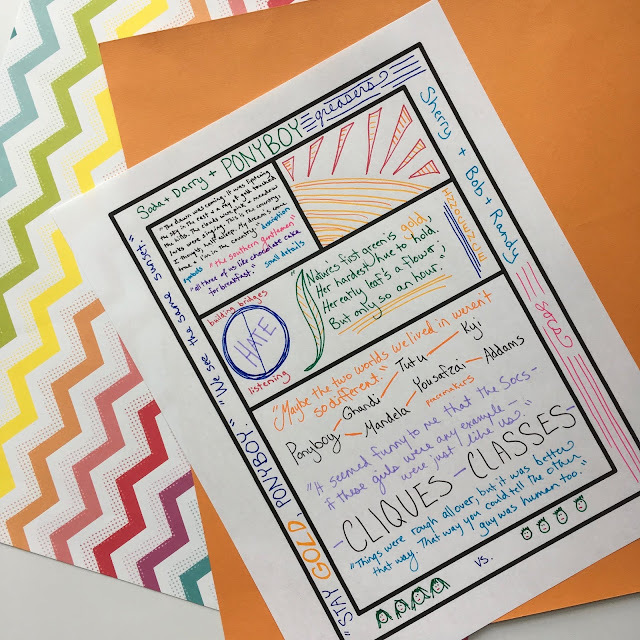 Poetry collage helps students cut through their fear of creating poetry, by letting them work with lines they search for in other people's poetry. It's a great way to ease students into the concept of writing their own poetry. 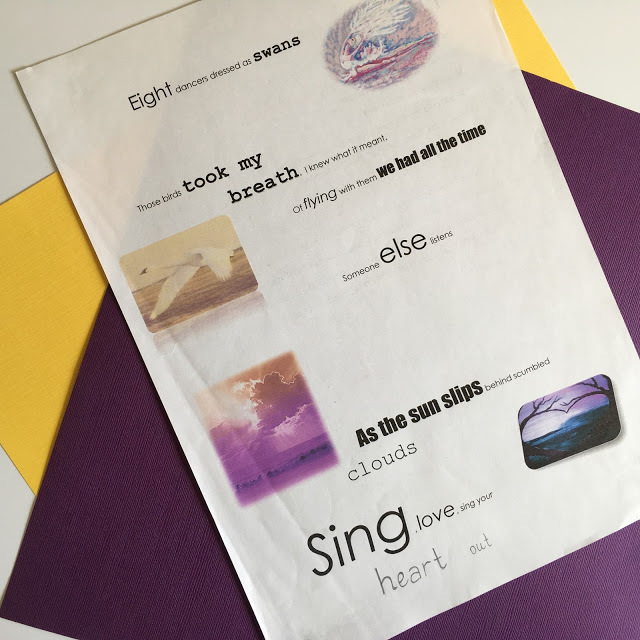 For this activity, they search through an online database of wonderful poems collected for high school students, then combine their favorite lines with related images to produce their own poetry collage. Get all the details for how to do it in this blog post. 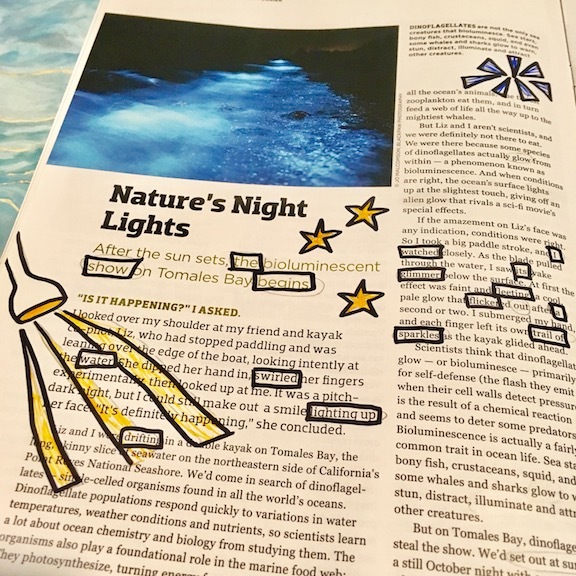 Blackout poetry is another solid option for helping students who are nervous about diving into the creative sphere create poems. Blackout poetry is a fairly simple process, and it produces stunning results. Get the step-by-step instructions and free curriculum set for blackout poetry in this post. One of my favorite ways to engage students with poetry is to study it while we produce our own poetry slam. You'll be amazed at how your students light up when they discover spoken word. I love to begin poetry slam units by having them judge strikingly different poems on video with the usual slam scores of 1-10 and defend their scores. It leads to great conversations about what makes poetry powerful and why one student might give a poem a two while another gives it a ten. If you want to explore poetry slam or spoken word as an option, check out this post or this full curriculum packet. Turns out you can use one-pagers for just about everything, including vocabulary. If you'd like to put a fun twist on your usual vocabulary study, try having students sketchnote the words. You can use a template like this if you want to, or just explain how to bring out the meaning using both words AND images and let them work on a blank page. One of my favorite ways to have students practice vocabulary is to show them a funny or intriguing youtube video and then give them a short related writing prompt. Then I ask them to use all their vocabulary words in their writing about the video. So, for example, I might play a video from the hilarious "where the heck is Matt?" youtube series, featuring a young man who travels the world and teaches people everywhere a simple and silly dance step to build community, then edits the footage together into popular videos. Then I might prompt them, "Imagine you were one of the people in one of the places shown in the video when this goofy guy appeared. Write about the experience, using all of your vocabulary words." You can get a more complete guide for this activity in the lesson I created for it over at readwritethink.org. If your school puts a focus on vocabulary word walls, try using this twist. After students create their word wall posters, have them stand up and form two circles, an inner and an outer. Have the two circles face each other, so the outer circle faces in and the inner circle faces out. Everyone should have a partner. Then give them thirty seconds to present their word wall posters to each other before calling for the inner or outer circle to rotate so everyone has a new partner. Rotate until everyone has had a chance to see a bunch of vocabulary words in action. Your students will be working on their speaking and presentation skills as well as their vocabulary retention, and the movement never hurts for helping everyone stay alert and engaged. Whew! That's a lot of lessons! Hopefully you found something here to help you plan an exciting day for your next teacher observation. You should get to enjoy showcasing your creativity and classroom community, not dread being judged. Finally, if you're a little sick of having your administration build their impression of you based on their short visits to your classroom, you might want to check out these seven ways to show your administration your strengths, whether or not there's an observation coming up.